Tetris is a game that has seen releases on just about every platform with a CPU, and some without one, too. It’s a perfect example of a simple concept that is approachable and intuitive to learn but is incredibly addicting and challenging at a higher level. 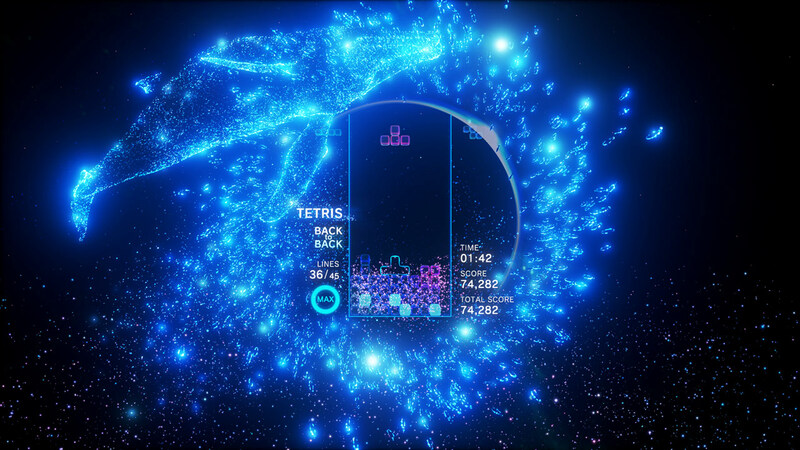 Tetris Effect takes the tried and true block clearing concept pioneered by Alexei Pajitnov and extends it to its natural conclusion. The result is a game that is in my opinion, the definitive version of Tetris. 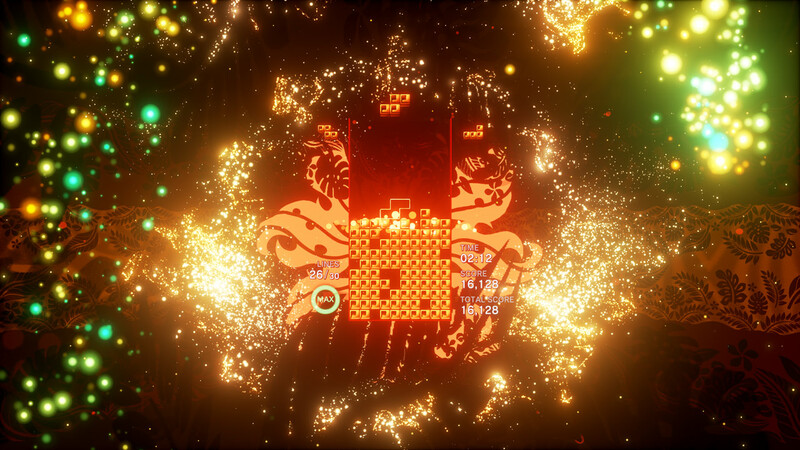 Tetris Effect is the latest incarnation of the original Tetris formula. Tetraminos, blocks made of four square segments fall from the top of the playfield. Your goal is to stack these blocks into rows that fill the width of the playfield. When you do, they vanish and the blocks that resided on top of those cleared rows drop down. It’s a simple concept. What sets this iteration of the game apart from the rest is Tetsuya Mizuguchi’s unique take on it. 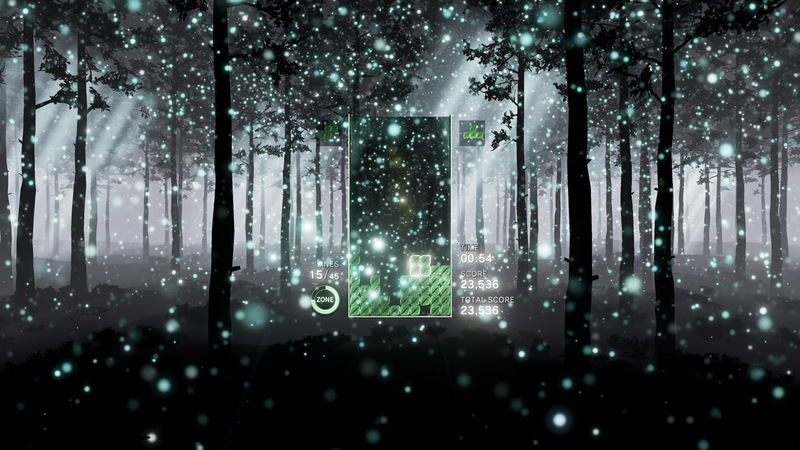 With Tetris Effect, this concept is blended together with Mizuguchi’s experience in building games that stimulate nearly all of your senses. The visuals are clean, yet gorgeous. The blocks can be either skinned to match the current background you’re playing on or set to resemble the NES version of Tetris that most people know and love. The backgrounds themselves animate and present stunning vistas around you as you play. Then there’s the music that, rather than taking a backseat and being something to either tolerate or turn off, becomes a main focus of the game. As you progress through the game, the music will build up bit by bit. Finally, there is the use of the DualShock 4s vibration function to stimulate your sense of touch. The result of all of this is a game that you can immerse yourself into. It’s a state that works both sides of your brain and does not require any external substances to achieve. This is as modern a take on Tetris as there is. As a result, modern Tetris conventions are in play here. The game has a number of options to tailor your gameplay to suit your tastes. You can choose the block colours, the number of pieces to see ahead, whether or no you want to be able to rotate a block upon it appearing at the top of the screen, and others. There are also many visual options available to you. You can choose whether the Tetraminos flash to the music, the vibrancy of the effects when clearing lines, and whether or not you want the playfield to be transparent or opaque. One slight criticism here, when the playfield is opaque, it still reflects the colour of the background. This can make some stages more difficult than necessary as the contrast between playfield and Tetraminos can be less than ideal. An option to have a completely black, non-reflective playfield would be a very welcome addition. It’s also fair to mention that at times the background’s effects can actually occlude your view of the playfield. This shouldn’t happen, ever. It’s a nice touch visually, but I need to see what I’m doing. The game’s controls are tight and responsive, and there is a fairly generous lock delay in play, so you have a little bit of time to rotate or slide a piece along the playfield before it locks into place. When the game starts getting faster, you’ll need to rely on this, a lot. So by now you’ve probably gone to the PlayStation Store and seen the $40 price tag. Really? $40, for Tetris? I remember paying that much for the original NES version and let me tell you, this is a far better version than that. Thankfully, Tetris Effect has a whole lot to offer. There are two main modes of play. Journey mode has you going through a series of levels, progressing from song to song. The difficulty of the levels is dependent on the music, rather than being a linear progression based on how many lines you clear. So you can have levels that start off easy, speed up frantically, and then when you hit that 20th line, slow the pace down again. This works better than you’d think it would and adds to the mental and emotional stimulus. Journey mode also features a brand new mechanic called Zone. As you clear lines, a Zone meter will fill up. Once you have enough meter, you can trigger the Zone with the left or right trigger. In this mode, time stops and you can place your pieces without the pressure of having them falling rapidly to the playfield. How long you stay in the Zone depends on how much meter you have. When you clear lines in the Zone they don’t immediately vanish. Instead, they go to the bottom and stay there. In the Zone, you can clear up to sixteen lines at once. Which is not easy to do. Once you complete Journey mode, you’ll unlock Theater mode. Here, you’ll be able to pick a stage and just watch the background and listen to the music. The second main mode is the Effect mode. This is where the rest of the game’s variations come into play. Classic Marathon, Ultra, Sprint modes are all present and accounted for. There are also relaxing modes with no Game Over penalty, as well as modes designed on focus and puzzle solving, including the Mystery mode, where the game will just mess with you because it can. This is also the mode where Weekend Rituals will take place. These are events where all of the online players contribute towards a collective point goal. If the goal is met, everyone unlocks a special Avatar. There’s plenty of stuff to do here. Finally, let’s talk tech for a moment. Tetris Effect features support for HDR displays. While it doesn’t have 4K support, HDR is a nice bonus. Then there’s the game’s party piece; Virtual Reality support. 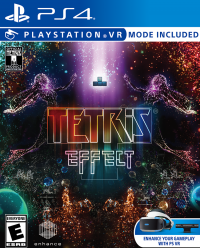 Instead of just looking at the background, Tetris Effect puts you in it, completely immersing you in the game. Playing in VR also has another slight benefit, the PSVR headset has lower input latency than most TV’s, so the game feels less laggy. Not that it feels sluggish, to begin with, but the 90hz refresh does help. Tetris Effect is the definitive Tetris game. It’s like a Greatest Hits collection. Everything everyone has ever enjoyed about Tetris wrapped up in one excellent package. If you own a PS4, you need this game in your collection. A copy of the game was purchased by the reviewer.